Two of my obsessions together - thanks, Pinterest! I Love the mac and cheese from Panera!!! It's amazing! Frappucinos might be one of the best things ever. I like hot coffee, but generally just prefer the stuff I make at home. I think I've had two fraps this year...on days when it got above 30*. Yummm, Panera mac and cheese is the best!! I always get you pick two and I can't leave without getting the shortbread sugar cookie. 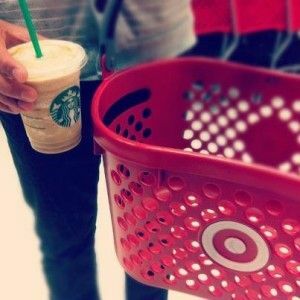 Target is another weakness, I never need anything and end up leaving with a bag full! YESSSSSSSSSS Panera mac and cheese! I found their recipe on Pinterest once but I haven't tried it yet! I probably should do that soon. Mmmm love mac n cheese AND brueggers! I'm getting hungry now!